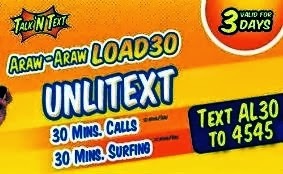 Newest promo from Talk N Text, the AL 30 "Araw-araw laod promo". The promo will give unlimited text to TNT/SMART subscribers, 30 minutes call, and 30 minutes free mobile internet. The promo code is easy to remember, and you can also load via SMART load center. The promo is valid for 3 days which the call and internet will be divided to 3 parts, which means 10 minutes call and 10 minutes mobile internet. The call can be used to SMART and Talk N Text subscribers. How to call: Dial *6565 + 11 numbers of TALK N TEXT/SMART subscribers. This is another affordable TNT promo, for only Php10.00 per day you'll get uni text, call, and internet. Suitable for everyone, enjoy TNT Ka-Tropa.